What is EMDR? EMDR is a highly effective revolutionary and breakthrough treatment for trauma, chronic pain, anxiety, anger, phobias, depression, negative core beliefs, and low self esteem/confidence. Typically, huge shifts in one's perceptions of themselves and their lives can occur in just a few powerful sessions. 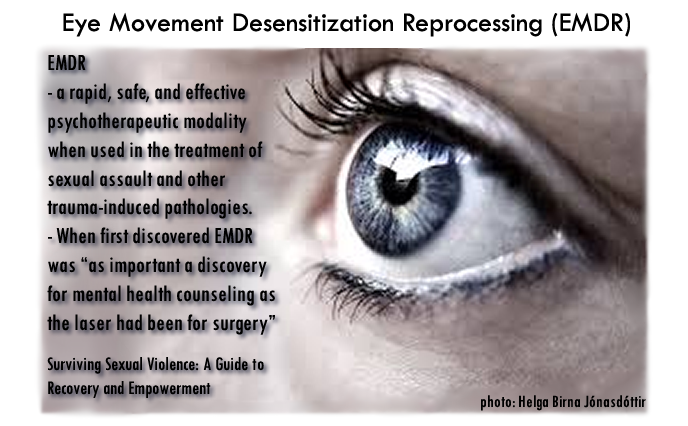 EMDR is the therapy of the future! I am one of the few Certified EMDR Trauma Therapists in the Piedmont Triad area and have years of experience helping people heal trauma safely and effectively, allowing them to remove powerful blocks holding them back from enjoying their lives and achieving their goals. No one knows how any form of psychotherapy works neurobiologically or in the brain. However, we do know that when a person is very upset, their brain cannot process information as it does ordinarily. One moment becomes "frozen in time," and remembering a trauma may feel as bad as going through it the first time because the images, sounds, smells, and feelings haven't changed. Such memories have a lasting negative effect that interferes with the way a person sees the world and the way they relate to other people. I was a member of the Canadian Army for over 20 years. I suffered from OSI (operational stress injury), depression, and the loss of my daughter and wife killed by a drunk driver. For over a year of treatment and work on my part, I have finally found some peace of mind, My anger and depression had lowered to a manageable level. Today, I see the light at the end of the tunnel.... I know that this treatment EMDR is by far the best I ever received in the mental health field, and the great thing is no meds. Thank you, G.C. A few years ago I underwent EMDR. I was skeptical, of course. At this point in time, however, I see that it saved my marriage, my sanity and my relationship with my children. I was suffering from PTSD after experiencing much loss and never even realized that's what stood in the way of a healthy life. It's a wonderful treatment and more people should be informed about it. I was lucky to run across it by accident. Thank you, J.M. Watch the following video about this powerful therapy, by its founder, Dr. Francine Shapiro.